This type of survey produces what is known as a Reference Plan (R-Plan). The R-Plan becomes a publically accessible document at its corresponding Registry Office. Registry Offices contain a variety of publically available documents such as, Subdivision Plans, Deeds, Mortgages, Liens, etc. 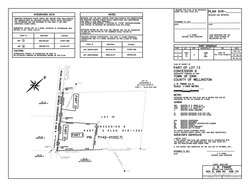 R-Plans accurately illustrate new or existing legal boundaries of parcels of land and may also show parcels, containing rights-of-way or easements (i.e. : in favour of utility companies or municipalities). Typically these plans do not show structures located on or adjacent to the property unless they directly affect or form the boundaries of the property. Municipality: Helps clarify zoning or by-law compliance and fulfill conditions of consent such as frontage or area requirements.